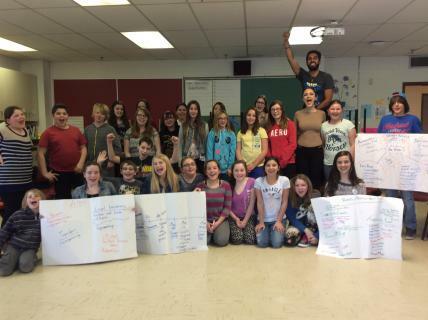 On April 21st, Trenton Middle School had the pleasure of hosting a presentation and workshop with two Free the Children (link) ambassadors, Ashley Hassard and Amar Deshwar. Ashley and Amar gave a motivating presentation on food security to the entire student body. The ambassadors enlightened the students on the state of food insecurity locally and globally in an interactive and memorable fashion. After the presentation, 25 student leaders worked with the presenters to create an action plan to help alleviate food insecurity in our local community.